Pavot is a spacious gite at Laugerie Basse, and is part of a traditional Perigordine farmhouse circa 1790. It is one of 4 gites in a barn conversion, which also offers the Pigeonnier. Ideal for a relaxing get away for couples and families. Also available to rent in it's entirety for larger groups. Set in 5 acres of well tended, beautiful gardens and orchards, we boast a large heated swimming pool and spacious sun bathing area, with comfortable sunbeds, parasols, loungers, tables and chairs. Guests can also enjoy the use of 4 adult bikes, table tennis, swings and seesaw (for the little ones), badminton and a BBQ area with two BBQ's. Close to St Cyprien's with it's famous Sunday Market 2km, and its many restaurants, bars, boutiques, shops and supermarkets. We are situated 800 metres from the River Dordogne, with all its sports and leisure activities. Minutes from the stunning castles and Beaux Village de France - Ancient Berbiguieres village with it's 12th century chateaux and church is 2km, Chateau des Milandes 6km, Beynac Castle 11km, Castelnaud 13km, Roque-Gageac 15km, Sarlat 18km. Take in the prehistoric sites at Les Eyzies, and visit the museum or take in a cave or ten. Escape to a few of the many medieval Bastide towns and Beaux Village de France. Excellent hiking and cycling opportunities through ancient woodlands. Enjoy stunning and far reaching views from Domme 15km or Belves 6km. Laugerie Basse is in the fortunate position of being a rural retreat, without being isolated, and is central to everything you could wish to do or see, while holidaying in this most beautiful part of France. Having taken several holidays in the Dordogne, we resolved to start a Gite business in the area, and after an exhaustive search, bought Laugerie Basse in May 2010. Very glad to be out of the city and into a wonderfully relaxed and stunningly beautiful part of the world. Due to our joie de vivre and relaxed attitude, we have made many friends here, and are very fortunate to have a lot of return guests from all over the world. We love it here and we are sure you will too! After spending many happy holidays in this region, we made a decision to have a life change. After viewing lots of properties, we came back to Laugerie Basse, our first viewing, and by far the best property we had looked at. We work in an environment that is not stressful. We are surrounded by beauty, both in and out of our property and have a dream life. We love people, so running a gite business has come as second nature. Both of us having worked in people industries. Anthony was in advertising and I was in marketing and training. This was such a great decision for us! We have wonderful and supportive community. The locals are very friendly, and we have made more than our fair share of friends while here. We are close to the shops and facilities of St Cyprien, Sarlat, Bergerac and Perigaux, so have the best of all worlds. We are rural without seclusion and in the heart of Dordogne, with all the tourist sites of interest, very close by. We have stunning countryside, are surrounded by history and have a feast of activities to enjoy throughout the year. The benefit of having such a large heated pool and 2 hectares of mature gardens with fruit trees and vines, is just a bonus. We love it here and are sure you will too! Spacious shower room with storage, sink and WC. Electric heater with towel rail. By request at the main house. Every room has an electric radiator. Bed Linen, duvets and pillows are provided on request. We have tables and chairs near to the house, for use of the WiFi, which is free to guests. We provide towels for washing and showering, but do not provide pool towels. Large open space with double french doors onto the patio. Dining table and 4 chairs, large sideboard, 2 armchairs and large sofa (bed), coffee table and side table, standard lamp. TV and DVD. Large Persian rug and light proof curtains. A full set of dishware, glasses and cutlery is provided. As are pans and cooking dishes. Everything you will need is provided. Kitchenette - electric hob, oven, fridge and separate freezer, dishwasher, microwave, toaster, coffee machine, kettle. Full inventory of dishware, cutlery, pans, utensils, glassware, and plastic-ware for the pool area. We provide indoor and outdoor dining tables and chairs. 2 hectares of beautiful mature gardens with fruit and nut trees. The fruit is free to guests when in season. We also have football nets, table tennis, badminton and some swings for the children. With table, chairs and sun umbrellas. BBQ area near the pool. There are many canoe stations along the Dordogne and Vezere rivers, the nearest one, Le Plongeoir, is walking distance, 2 minutes by car or 7 minute leisurely walk. Four adult bikes by reservation. We do not cover guests for insurance, so suggest you have your own cover before venturing forth! Boat trips on the Dordogne can be arranged through the appropriate companies. All gites have a veranda or patio area. Floats and inflatable toys for children. Swimming aids. We are in the centre of what is termed the Golden Triangle, things to do in the region include: Golf - Lolivarie 18 holes, 4km. La Forge 9 holes, 5km. Equestrian Centre, horse Riding 5km. River Canoes hire 1km (and several more). Tennis Courts 2km. Fishing 1km (easy access to permits). Air Park 9km. Water Park 6km. Hot Air Ballooning 10km. There are 10 villages in Dordogne, and 2 villages in Lot et Garonne which have been given the prestigious award of the most beautiful villages in France 'Les Plus Beaux Villages de France'. We are lucky enough to be situated within easy drive of all of them. Whether you couple up a day visiting the villages, castles and other attractions or just do a tour of the villages, they are all very special. Château de Beynac, Chateau de Castelnaud, Chateau de Biron, Chateau des Milandes, Chateau de Jumilhac, Chateau de Commarque, all within easy drive, including Bastides (walled cities) such as Domme, Monpazier and Belves and Beaumont. Large 12m x 5.5m heated pool with extensive stone terrace for sun bathing. Very comfortable sun beds and parasols! Additional table and chairs and 2 patio lounging areas. Notes on accommodation: In the heart of Dordogne, central to the many attractions of this region. We provide a large shared, heated pool 12m x 5.5m, with an extensive south facing terrace, includes 8 large, padded sun loungers and a side table per pair. Parasols, 2 sets of lounger chairs and sofas seat 8, with coffee tables. A selection of floating pool beds and child friendly pool toys. BBQ area with dining table and chairs. 2 Benches in the orchard. 2 hectares of beautiful mature gardens. A variety of games: Badminton, table tennis, children,s football nets (often used by adults), cricket and Boules. Free fruit from the trees available in season. Utility Room: 2 Washing machines/dryer, iron, ironing board, hairdryer. selection of DVD's English and French. Highchair, cot, baby bath available on booking. Tourist information, maps and flyers. Clothes line in garden. Cleaning / Towels / Linen Bath and hand towels and bedding provided. Cleaning is extra at £35 and is mandatory at the end of your holiday. Other: All gites have a spacious patio or balcony with table, sun umbrella and 4 chairs. Stunning views of the gardens and pool. This is a really fine place to stay! Our hosts were both helpful and discrete. All the facilities (flat, pool, barbecue etc) were in perfect order, the park was big and peaceful with beautiful trees and plants, and Janine and Anthony had a fine balance between help and discretion. They really care for there guests and we were even invited to a dinner with there friends which was nice and very interesting as we met people from several European Countries. Saint Cyprien is not far away and this town has all you need. - we went there on bikes for market, going to restaurants and so on. My wife and I had a wonderful week in our Gite. We were welcomed by Janine and Anthony and soon felt at home. We drove down from Calais with an overnight stay in Le Mans and our return journey a week later In Bagnoles-de-l'orne. The Gite was fully equipped for all that you would need with a lovely view of the gorgeous swimming pool and grounds. We swam everyday and enjoyed some great cycle rides, walks, canoeing and visits to spectacular Chateaux's. Janine and Anthony gave us some great tips on where to visit and eat. The Gite was in walking distance of St Cyprien a flat walk of 30 minutes over the bridge and into the town. There were various restaurants and bars but the town seemed very quiet except on Sunday (market day). The supermarket and petrol station also very handy for supplies. We will hold fond memories of sitting at our outside table watching the wildlife and also sharing a glass of wine or two with our wonderful hosts. We hope to be able to return in the future and enjoy again all the delights the Dordogne holds . Very clean - well equipped, spacious with a lovely terrace with table & chairs to enjoy views. Anthony & Janine couldn't have been more welcoming or hospitable. We given a guided tour & then sat with them to enjoy a glass of wine. The Gite was superb, plenty of cutlery - china and kitchen utensils. Very nice terrace right outside of the gite with table - chairs and umbrella to sit and while away the hours in an evening. The heated swimming pool was great with comfy sun loungers - barbecue area with table and chairs. This was our first trip to France in the car and we couldn't have picked a better area or property to stay in. Myself, wife and 5 year old English springer spaniel thoroughly enjoyed ourselves. We would like to say a big thank you to Anthony & Janine for making us so welcome and making our first trip to France so enjoyable. We will be going back and would highly recommend this accommodation. These gites are situated in a beautiful, unspoiled, rural location and yet walking distance from the nearest town and right on top of the river Dordogne which is fantastic for safe family canoeing. Our gite was very well set out and equipped with a very comfortable sofa bed in the lounge area and bedroom with gorgeous traditional French furniture - the best gite we have stayed in in France and great value for money. We really enjoyed the pool , just a stone's throw from the gites with quality sunbeds and surrounded by fields and lovely gardens. We made use of the brick-built bbq by the pool and the laundry room with free use of washing machine was a bonus. The hosts, Janine and Anthony were very welcoming and helpful. The welcome aperitif and canapes they put on was a lovely touch and we enjoyed a fabulous lunch with them and some other guests at a local restaurant on our last day. We highly recommend this property and the area - there is something for everyone - castles, caves and canoeing to name just a few of the many attractions.We highly recommend Laugerie Basse and intend to go back! We had a wonderful holiday at these gites. Firstly, and as all the other reviews have said, they are brilliantly situated in this area. There is so much to do, for adults and kids, all within 20 minutes by car, all leaflets are found in the gites. The gites themselves and their facilities are probably the best we have stayed in. Our son loved them because of the land around the gites and pool to play football, cricket, ping pong etc, all provided by the owners. Lastly, Janine and Anthony were warm, welcoming hosts who were always there to answer any questions with a smile and sometimes a beer! Anthony also took my husband to play golf one morning (my husband was having withdrawal symptoms!). This is the first review I have ever written as I highly recommend these gites. So nice of you, thank you. We loved meeting you all and we are so glad you chose us for your holiday. Perfect accommodation in peaceful location. Laugerie Basse is a beautiful well maintained property. We have stayed here twice and will certainly be going again. Everything you need is in the gites, we have never stayed in such a well equipped accommodation. and there is a separate shared laundry room. The pool is fantastic it is heated and it has a barbecue area just at the side. The grounds and orchard area are very well maintained and if the fruit is ripe you can pick your own. We hired a car from the airport and the drive to the accommodation is beautiful and takes less than an hour following the very easy directions which the owner can send to you. We stayed for two weeks and visited many amazing places with a 30 minute radius as well as having lazy days around the pool. Shopping is easy just a 5 minute drive from the accommodation is a large supermarket. And a great market on a Sunday. The owners Janine & Anthony are really friendly and are very knowledgeable about the local area, whilst there we visited Sarlat, Belves, Domme, Chateau de MIlandes, Cabanes Du breuil , Chateau de Commarque, Jardin de Marquessac, La Roque Gaegac, Maison Forte de Raignac, Parc la Bournat, Roque saint Christophe and many other amazing and beautiful places. 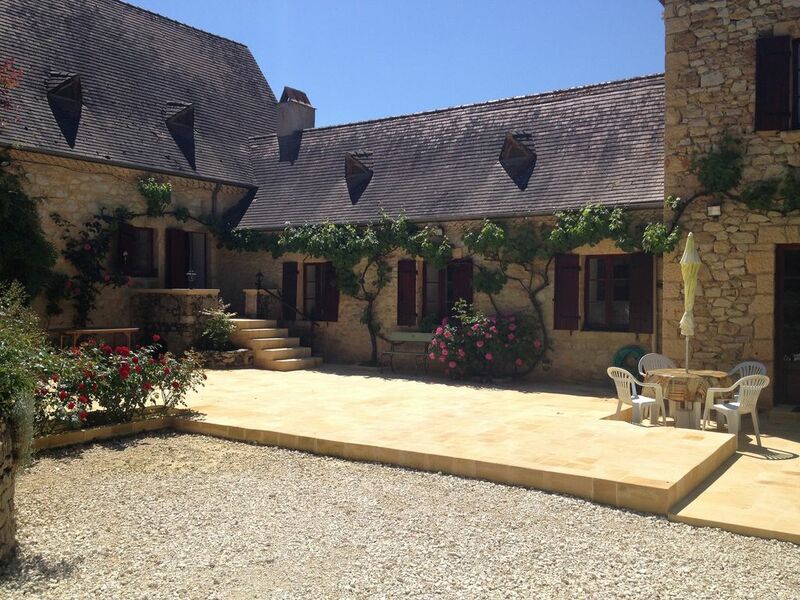 We will definitely be re booking this accomadation and love the Dordogne. I recommend this property to all my friends and family. Can be sourced on request! Airports - Bergerac 50 mins, Brive 1hr 10mins, Bordeaux 2hrs 30mins, Limoges 2hrs 15mins. Car recommended and available to hire at all airports and major towns. Driving - 50 mins from A20 (Souillac) and 50 mins from A89 (Perigueux). 7 hours from Caen and 10 hours from Calais. Paris is 5.5 hours away. St Cyprien is a 3 minute drive, 25 minute walk, 10 minute bike ride. It has a Carrefour supermarket, a mini market open all day, and several shops: butcher, baker, fish shop, antiques and collectables, boutiques, household goods and several very good restaurants and bars. We also have 2 banks, a post office and 3 ATM's. We have a fantastic Sunday Market and local producers on Thursday am. There are other outdoor markets in the area every day. Booking Notes: Please contact the proprietors for confirmation. A 50%, non refundable, booking deposit is required to confirm the reservation, within 48 hours. The balance is due 12 weeks before holiday start date. If the accommodation is booked within 12 weeks of the start date of your holiday, then 100% payment by, bank transfer, is required to confirm the reservation. High season minimum of 7 days. Saturday to Saturday. Short stay and mid week dates available at other times and on request. Changeover Day: Saturday to Saturday - high and mid season. Short stay and mid week dates available low season. Property is available from 4pm on arrival day and must be vacated by 10am on departure day. Notes on prices: For low season, midweek and short stay lets, please contact the proprietors for prices and availability.